Myanmar is a member state of the CITES MIKE programme. This project aims to build institutional capacity within the Myanmar Nature & Wildlife Conservation Division of the Department of Forestry to improve the long-term management of the elephant populations within Myanmar. Before this monitoring can be started, the relevant patrol officers from the MIKE sites need to be taught the necessary skills and given the appropriate equipment for them to competently and continuously monitor the law enforcement efforts made in these areas. Such skills are map and compass navigation skills, use of the GPS, and field record taking using approved MIKE forms. This training will improve officers’ ability to monitor elephant populations, improve detection of changes in levels of illegal killing and to use this information to provide more effective law enforcement in the field. This training will also lead to systematic recording and reduction of human/elephant conflict. The first Law Enforcement Monitoring training in Myanmar took place in November 2005 and it was a great success. It was so successful that the Government asked for the training to be given again in the Hyuakong Valley in the far north and it was particularly satisfying because some officers that were trained on the first course were able to act as instructors on the second one. The next step is to train people in getting the patrol report data from the paper reports into the computers which have already been installed in the sites and at the HQ in Yangon. This will be done by use of another modular training course which will be translated (as was the first) into Burmese. There will also be training in approved elephant population survey techniques. This will be the first time that standardized surveys will be done in Myanmar and it should be a challenging exercise simply because of the logistics. This is also the first time that such standardized teaching and data recording has been attempted over the global range of an endangered species. 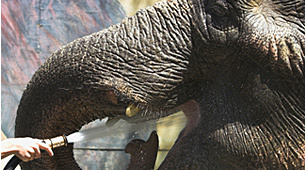 While MIKE is specific to elephants, much of the training given is of immediate relevance to day-to-day duties of field conservation staff and goes some way to fulfilling the requirements of the ASEAN (Association of Southeast Asian Nations) listed competencies for conservation staff, which is also the first opportunity of its kind. Many participating countries see the MIKE programme as not only a way to improve their elephant management but also as a means of introducing standardization of field data collection for other conservation objectives.